Offense was at a premium through most of the 1st period, but then the power-plays went to work. First the Rangers got on the board at 16:38 then it was the Bulldogs turn. With a 5-on-3 advantage Logan Morrison (8) tied the game 1-1 and then 25-seconds later Arthur Kaliyev (39) on the power-play gave Hamilton a 2-1 lead. Hamilton’s power-play went 3-for-3 early in the 2nd as Kaliyev (40) scored his second of the game to give the Bulldogs a 3-1 lead with Matthew Strome (25), who already had three assists, making it 4-1 at 6:02. Kitchener eased the Hamilton momentum with a goal at 14:31 to cut the Bulldogs lead to 4-2 after 40-minutes. The Rangers got back in the game in the 3rd period with back-to-back short-handed goals on the same Bulldogs power-play to tie the game 4-4. However, with Kitchener applying the pressure, Jan Jenik (5) made no mistake on a breakaway at 14:27 to restore the Bulldogs lead at 5-4 with Arthur Kaliyev (41) finishing off his hat-trick with an empty-net goal at 19:57 to make the final 6-4. Hamilton was 3-for-6 on the powerplay while Kitchener was 1-for- 2. Kitchener goal scorers were Jonathan Yantsis (37), Greg Meireles (25, 26), and Rickard Hugg (25). 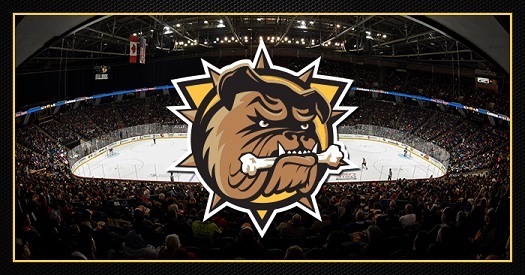 The Bulldogs return to FirstOntario Centre tomorrow when they host the league leading Ottawa 67’s at 4pm.